Schulz, Berlin Wall at the East Side Gallery i Berlin, Tyskland : Boka nu! 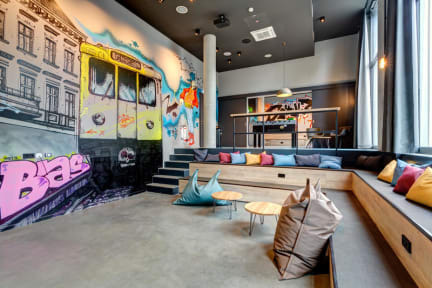 Between the Spree-River and the Berlin Wall: Enjoy urban flair and hostel spirit while indulging in hotel comfort. All in the most hip part of the city. Schulz stands for open-mindness: we welcome everyone. Our triprid of Hotel, Hostel and Apartment offers a home for guests from all over the world – business travelers, backpackers, families, couples or students. Parts of the profits are donated to social projects. For food we offer a range of a la carte, buffet or the use of our guest kitchen. We cater international and German cuisine to a wide range of palates and dietary needs - vegetarian, gluten-free, halal, vegan and to individuals with allergies. 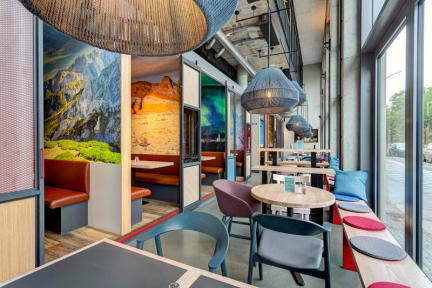 Located directly along a preserved section of the infamous Berlin Wall and featuring views of the Spree River, Schulz Hotel lets you discover the most hip quarters of the city, Friedrichshain and Kreuzberg. With the train station Ostbahnhof practically at your doorstep, you can conviently reach places like Alexanderplatz, Berlin Fair or the airports Tegel and Schönefeld. The newly opened Hotel offers you fully furnished rooms including highspeed wifi, Smart TV and ensuite design-bathroom with care products. Choose between a single-room, double room, multi-bed-room and dorm. Our rooms offer space for one to four people. Relax in our student lounge with a table football and cinema, hang out in our beer garden located right next to the Berlin Wall or enjoy a drink at our bar.